The creative process through which outstanding architectural design necessarily unfolds requires spontaneity and free-spirited openness. Each project demands close individualized attention to both the client's needs and to the environment in order to achieve the highest results. This new residence was built at the former site of Nancy's Secret Garden in Key West. The main criteria in the design was to retain and work around the existing vegetation, directing the views to the garden and creating an outdoor living space half the size of the inside areas. 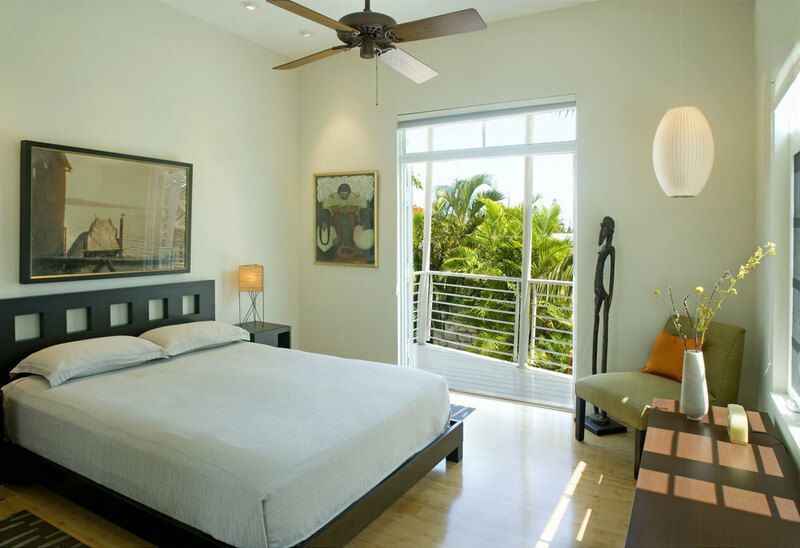 Johnson Street, near the casa Marina area in Key West, has an assortment of contemporary homes. This renovation included impact resistant doors and windows, privacy fence and entryway, carport, and interior renovations of two bathrooms. Additions to this landmark Queen Anne home include a kitchen, bedroom and bath which are joined at the rear of the historic structure plus two detached buildings. The addition and structures were configured around the sunburst swimming pool meticulously hand crafted of imported Mexican glass tile. The carriage house at the north end of the pool consists of a garage on the first floor and guest quarters on the second floor. The pool house across from the main house includes guest quarters, gym, porch and bar. Preserving the post-war modernism of this mid-century, mid-town gem was foremost in mind for this renovation and addition. Features such as terrazzo floors, casement windows, as well as the furnishings reflect the period and the spirit of the home. The upstairs addition includes a master bedroom and bath and appears as original to the house. Guillermo selected all furnishings and accessories which are a combination of vintage, modern and contemporary. Two houses were joined together by a breezeway and main entrance to create this stunning Old Town dwelling. Work included a complete rehabilitation of the two-story structure and renovation of the one-story structure, new outdoor living areas, swimming pool, spa, and decks. Architectural details were lovingly preserved, replicated, or recycled back into the project whenever possible. The renovation was recognized by the Historic Florida Keys Foundation and won the coveted ceramic Star for excellence. Miami architect Montgomery Atwater designed and built this home in 1952. The original Cuban tile floors, natural Florida cypress ceilings, and plaster walls were retained and restored. A solar array was added to take advantage of the abundant sunshine that Key West offers. The kitchen was reconfigured, a master bathroom was added and other elements of the original design were reincorporated respectful of the home's mid-century design. This home was awarded the ceramic star from the Historic Florida Keys Foundation. Guillermo selected all furnishings and accessories which are a combination of vintage, modern and contemporary. The two buildings are used as residences for visiting artists and contain living quarters and work studios. The buildings were in very poor condition and underwent major structural and cosmetic work along with rear porch and deck additions. The floors and walls were uncovered to expose the original materials; structural elements were recycled for use in rebuilding the staircase. The rehabilitation of the two buildings were recognized by Historic Florida Keys Foundation and each won the coveted ceramic Star for excellence. This 800 square foot home was gutted and the tiny rooms were reconfigured. Newly vaulted ceilings and an open layout has given this small home a much larger sense of space. The very small back yard now contains living and dining areas utilizing the same materials hence creating a seamless transition from indoors to out. The Historic Florida Keys Foundation awarded this home the highest honor of the ceramic star for renovation. This renovation was published in Coastal Living magazine. Key West cottages were most often built on small lots and of humble size. Respecting the original nature of the house, the renovation and porch addition to this 1 ½ story cottage made use of the existing space. The illusion of space was created with skylights and large openings facing the garden and pool. The renovation was recognized by the Historic Florida Keys Foundation and won the coveted ceramic Star for excellence. This house was originally built as a duplex on a double lot and turned into a single family residence. It was gutted and reconfigured to fit the new program: living room, outdoor living/dining areas, kitchen/dining area, master bedroom and bath, studio for two, guest bedroom/bath, loft/guestroom, and outdoor shower and decks. There are cathedral ceilings throughout with oversized exposed rafters giving a sense of space. Operable windows with remote controls at the gable end roofs allow for cross ventilation. A large outdoor living area with skylights and cutouts on the roof along the porches bring north lighting into the space. Integration of indoor and outdoor spaces was a critical aspect of the design.